Contrary to any rumors you may have heard, there is "no free dog bite" in New Jersey. New Jersey dog owners have "strict liability" when it comes to dog bite injuries caused by their dogs. To translate this legalese into plain English: just by virtue of owning a dog, they may be held responsible for injuries and losses to dog bite victims. Take photographs of the dog bite injury while it is fresh. Get emergency medical treatment for the dog bite victim. Follow doctor's orders to prevent infection and minimize scarring. When the dog bite victim is a child or a young woman, future ramifications can be particularly harsh if the attack results in heavy scarring to the face or other visible areas of the body. A dog bite victim of any age or gender may be affected in many areas of life. If you are parents of a young son or daughter bitten by a dog, we urge you not to underestimate the potential lifetime impact of a scar or nerve damage caused by the dog bite. Some people who are attacked by dogs require psychological counseling to deal with post-traumatic stress syndrome and other negative consequences of the dog bite incident. Even if the dog owner is a friend or relative whom you do not want to "sue," please talk to an attorney, and the sooner the better. Future consequences may be great when a personal injury is not properly documented or if your case is weakened by things that say or do without an attorney's advice. 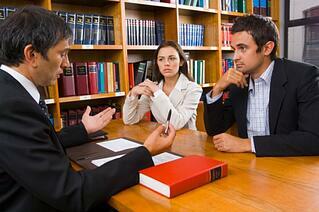 Our lawyers and staff believe that our clients' interests and concerns come first. We are determined to maintain the high-quality work ethic for which we are known. We are able to handle a large caseload, while maintaining the same level of effective performance for our clients. We never lose sight of the basic premise that our clients' best interests need to come first. Contact one of our Injury Lawyers today for a free initial consultation. We have offices in Wayne and Hoboken to serve you better.